GP offer turnkey project execution by supervising all site activities including process and plant piping, erection & commissioning of main equipment’s including performance tests and other special services within the stipulated time frame. A type various of engineering works. Relying on our rich expertise and proficiency in this field, we are noted as one of the prestigious service providers of Industrial Engineering Projects. This range of services are rendered by using the finest quality raw materials and most advanced technologies under the supervision of our adroit and experienced professionals. 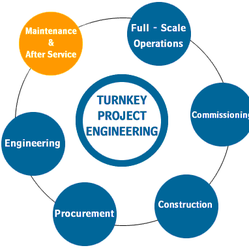 We hold expertise in providing excellent project engineering services to our clients. our professionals hold in-depth knowledge about the respective discipline and hence undertake the services brilliantly. Furthermore, our experts give total emphasis on planning, designing and finally manufacturing. Finalize the project proposals for land development, water resource management, development of rain water harvesting with watershed, efficient irrigation systems using Smart Precision farming technologies, agro forestry and renewable power / energy based on the information obtained during site analysis and survey. On the basis of the experiences gained over decades, a globally acting Cement Project Department has already been established in 1996. Specially trained engineers manage the project business from the initial tendering until final taking over of the project. An air brake or, more formally, a compressed air brake system, is a type of friction brake for vehicles in which compressed air pressing on a piston is used to apply the pressure to the brake pad needed to stop the vehicle.